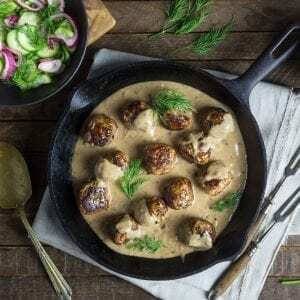 Real, hømemåde Swedish meatballs in a rich, cream gravy is as comforting as dinner gets. Serve it with boiled potatoes, lingonberry preserves and cucumber salad. Yeah, I’d have no idea about that (wipes nutmeg-scented gravy off lips with a Guldlök napkin). 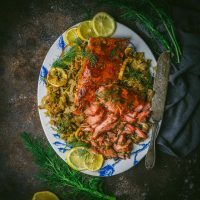 Dill has a lovely, lemony flavor that complements the rich sauce. We also use it in the cucumber salad. Visit Sweden for its beautiful landscape and majestic moose. For many Americans, Ikea Swedish meatballs are the only version they’ve had, which is a shame because, tasty as they are, they’re also mass-produced and kind of bland. It wasn’t until a couple of years ago when Matt and I went to an excellent Swedish restaurant in Hudson (DaBa, now sadly closed), that I realized just how much flavor real Swedish meatballs could have. This version is loosely based on the version we had at DaBa, and also influenced by a recipe by the fantastic Swedish chef, Marcus Samuelsson. 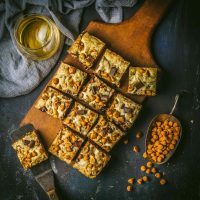 While our recipe is pretty traditional, I’m adding an extra ‘ish’ onto Swedish to placate any Scandinavian purists who might balk at any recipe that doesn’t exactly match their Mormor Ingrid’s. A dash of Worcestershire sauce and a spoonful of mustard may not be standard, but they add a lovely bit of extra zing to the creamy sauce. 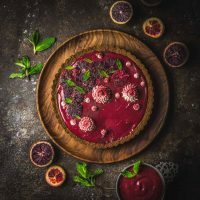 In fact, our version also has a little lingonberry jam and a tablespoon or so of the delicious brine from the quick-pickled cucumbers (thank you, Marcus Samuelsson). The result is a sauce that’s creamy and rich and not the least bit bland. With simple boiled potatoes, Cucumber and Red Onion Salad with Dill and lingonberry jam, this is a stellar dinner. Good for people or moose. For the meatballs themselves, we use a 50/50 mix of pork and beef. You can also add veal to the mix, but it’s not necessary. We do recommend using fresh nutmeg because it has much more flavor than the pre-ground stuff. You’ll definitely taste the difference here. The technique will be familiar to anyone who makes Italian-style meatballs. A mix of meat, some bread soaked in milk for moisture (called a panade), an egg for binding. Using white bread will result in the most tender meatballs, but panko is a decent substitute. Dry Italian-style crumbs will result in the heaviest texture so we don’t recommend them here. 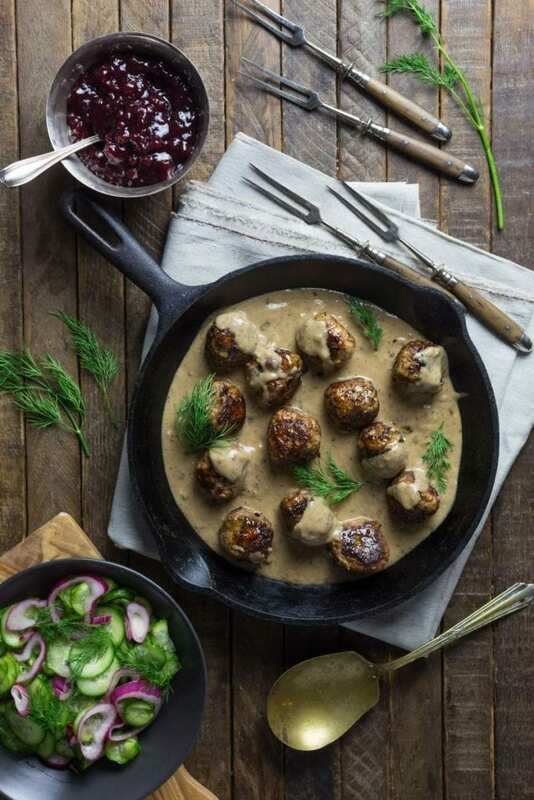 Traditional Swedish meatballs are quite springy in texture which happens when the meat mixture is aggressively mixed, usually with an electric beater, until it becomes almost a paste. I like to keep them soft and tender (awwwww), so I mixed it pretty gently just using my hands. Enough to fully combine everything, but not too much more than that. The soft meatballs may flatten a little on the side as you cook them, but that’s okay. Let them get beautifully brown and then gently turn them and brown the other side. Keep turning them as they cook until they’re brown all over. They may not look like perfect balls (heh heh, I am 12) but they will taste glorious and leave delicious brown bits on the bottom of your pan which will flavor your sauce. Traditional Swedish meatballs are springy and perfectly round. Ours are more tender and rustic. A moose bit my sister once. We recommend serving them with boiled baby potatoes, lingonberry (or red currant) jam and Swedish Cucumber and Red Onion Salad with Dill. 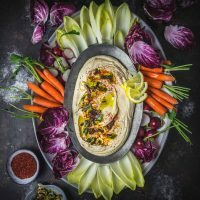 The bright, vinegary tang of the salad is not only a great foil for the rich dish, you can also use a tablespoon of the brine in the sauce itself to perk up the flavor. If you’re not making the cucumbers, you can use the brine from any pickle jar in your fridge, or just use a little white wine vinegar. Now we’re making our own meatballs, we don’t go to Ikea so much any more. It’s okay, though, we’ve taken to drawing arrows on the floor and blocking all the doors with furniture so it takes an hour to find the bathroom. Skål! 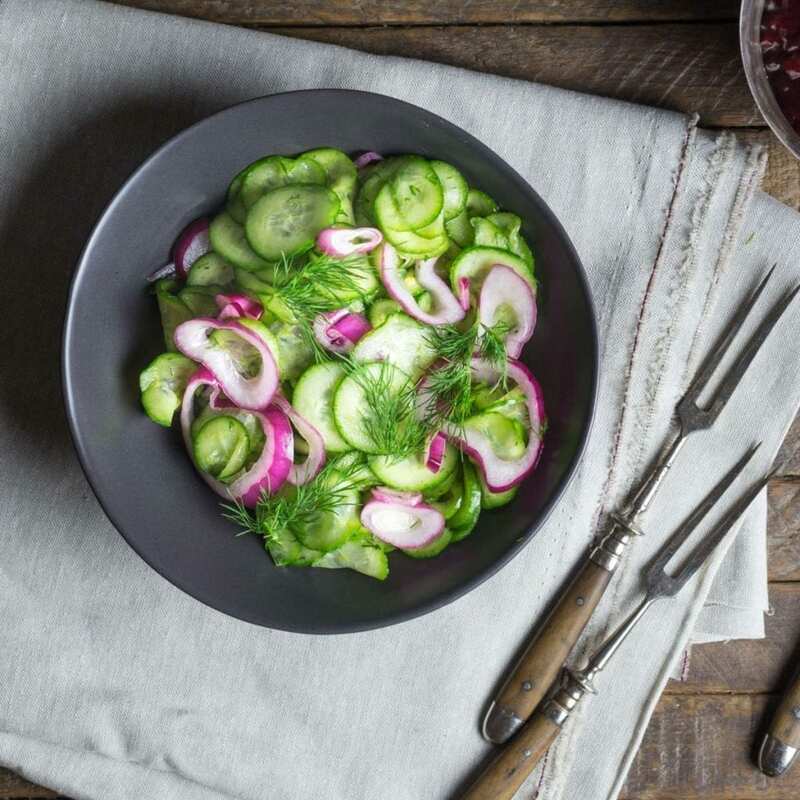 This Swedish Cucumber and Red Onion Salad with Dill is so good, we’ll make it all year long. Combine the breadcrumbs and heavy cream in a large bowl, stirring with a fork until all the crumbs are moistened. Set aside for at least 5 minutes to let crumbs absorb liquid. Melt 1 tablespoon of the butter in a 12-inch straight sided sauté pan set over medium heat. Add the onion and a pinch of salt and sweat until the onions are soft and golden, 4 to 5 minutes. Remove from the heat and set aside. In the bowl with the breadcrumbs, add the sautéed onion, ground beef, pork, egg, nutmeg, salt and pepper and mix well with your hands until completely combined. Melt the rest of the butter in the skillet over medium-high heat. Add the meatballs, in batches if necessary, and cook, turning frequently, for about 7 minutes until browned on all sides and cooked through. Transfer the meatballs to a plate and drain off all but 1 tablespoon of fat from the skillet. Decrease the heat to low and add the flour to the skillet. Whisk until lightly browned, approximately 1 to 2 minutes. Return the skillet to the heat, whisk in the stock, cream, preserves, pickle juice, Worcestershire sauce, and mustard, and bring to a simmer. Season to taste with salt and pepper. If you want to reheat the meatballs, add them to the sauce, reduce the heat to medium and simmer for about five minutes, until the the meatballs are heated through. I made these today with the cucumber/onion salad. The meatballs were amazing, even without the cream sauce. I felt the cream sauce was a little too sweet for my taste, I would add less preserves next time- but this was only a minor flaw, so I still gave the recipe 5 stars. Sorry, being a Swede where people don’t know the difference between Sweden and Switzerland, the ø in homemade draws my attention, considering it’s not a Swedish letter, looks like a pretty normal recipe. Swedes eat a ton of boiled potatoes which is why they usually use grated, leftover boiled potatoes instead of breadcrumbs. After grating the potato, grate the onion instead of chopping to draw out the moisture (then you don’t need to saute first). Then season with white pepper instead of black pepper for more complexity. For the pickles and gravy, find your local German grocer and look for Surig Essig Essenz, it’s a higher concentration of vinegar, not made in the states, similar to ättika, dilute properly, way better flavor for pickling. Hope this helps.